Thanks to our extensive route network, now we can reach a wide variety of destinations in America and Spain. Additionally, with our interline agreements you can connect to the five continents in a synchronized and expedite manner. To complement these benefits, we have additional logistics services to help expand your portfolio and simplify the logistics chain, satisfying your needs, your customers' as well as maximize the benefit of both in your logistic chain. Temperature control and short transits are key elements in prolonging the life of perishable products. We have operations at Miami Airport, where you can reduce processing time and ensure better preservation of the cold chain. Nationalization of cargo and documentary support: We offer support and service for various procedures in different governmental entities such as the USDA, FDA, etc. For more information regarding the availability of these services in your area, please contact your local cargo adviser. Documentation: We carry out and print the air waybill that the cargo will use to fly to the final destination. With our agent network, we carry out nationalization of your cargo at the major ports and airports in the United States, helping to make your business more efficient. 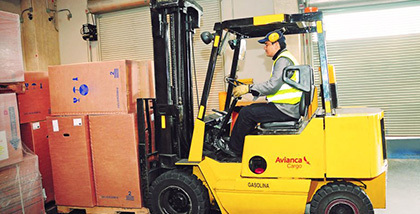 Your customer's warehouse may be located far away from the airport or the port of destination; in this case, we provide land transportation so you can offer your customers a door-to-door service. We provide replacement service for those dry ice temperature sensitive products, that being transported in containers require the help of this input to maintain the cold chain. Handling dry ice requires special conditions, so this replacement procedure is performed by highly qualified personnel and following the most stringent safety standards. We take care of every detail during your best friend’s trip, that is why our service focuses on the welfare and needs of your pet. Pickup and delivery: We pick up your pet at your home and take it to the airport. Our priority is to guarantee that your best friend is always safe and comfortable. Health documents: We coordinate all veterinary services required for the safe transport of your pet including the issuing of health certificate. Logistics coordination: We take care of all airline reservations and paperwork, also, we make sure your pet always takes the best flight according to your travel needs. USDA endorsements & customs clearance: We prepare the required documentation and present it to the governmental agencies for processing.